Today I have installed Juno. Because it is important for me to have tray icons for programs, I used the answer in this thread to get that functionality back. 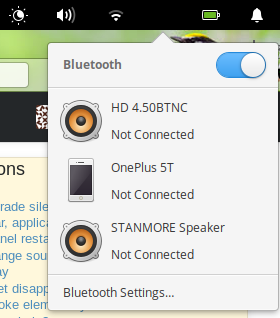 However, after logging out & in, the bluetooth image disappeared, even though there is a placeholder and the functionality is still there as can been from the screenshot. This is a reported bug. And a fix was recently approved.